Evaluation means to examine carefully. Evaluation to most has been that dreaded meeting happening once a year with the supervisor. It has developed into a platform of criticism and judgment —sometimes even related to financial compensation. Forget all that. 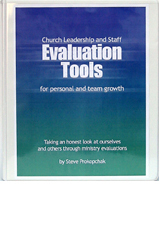 It’s a new day when we discuss evaluation for personal and spiritual growth. This notebook of reproducible evaluation tools is about a careful examination because someone cares. Getting feedback to determine strengths, solidify vision and mission, open dialogue and discussion, and to provide goals for future training is what evaluation should be about. This process, then, becomes a positive experience for each of us. You will discover the answer to all these questions by utilizing each of these evaluation forms. When we discover how we’re doing through the feedback of those who are close to us in ministry, we also discover our value to the team.